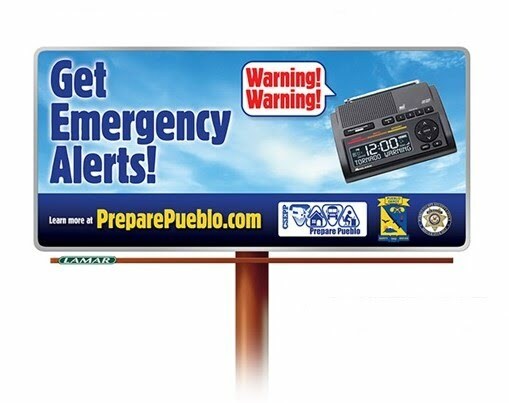 The Pueblo County Sheriff’s Office, through the Chemical Stockpile Emergency Preparedness Program, has replaced tone alert radios (TARs) with new, state-of-the-art weather radios for select residents and businesses in Eastern Pueblo County. The new radios were delivered directly to homes and businesses in the designated areas. The new weather radios provide alerts for chemical incidents related to the stockpile at the Pueblo Chemical Depot and also will alert residents of any weather-related event in the area. In the event of an emergency, the radio will sound a tone followed by a voice message giving information and instructions on what should be done. The existing tone alert radios are still functional and residents are welcome to keep them if they choose. The new weather radios were purchased through the Chemical Stockpile Emergency Preparedness Program. The Chemical Stockpile Emergency Preparedness Program was created in 1988 by Congress to enhance the preparedness of communities in the event of an emergency related to the chemical stockpile stored at depots throughout the nation. Pueblo Chemical Depot is one of only two remaining sites that still have a chemical stockpile. Disasters/Emergencies can happen at any time? Are you prepared?? Floods, wildfires, blizzards, wind storms, power outages… These are all things that can and do happen in our region. Will you be prepared? Do you have a 72-hour emergency kit prepared? Do you have a family emergency plan? Do you any alternative methods of communication, light or heat in the event of a power outage? Do you have an evacuation plan? Could you shelter-in-place if ask to do so?? These are just a few of the things you and your family should do to prepare for any emergency. Don’t wait for disaster to strike, begin planning today. · Don’t know where to begin, start by making a family emergency communication plan. Designate where each family member will go during an emergency; what each member will do and how to reconnect. · Designate evacuation routes leading out of your home, your neighborhood and your city. · Include contact numbers for all family members, day care centers, schools, nursing homes, and other important contacts. · Create a 72-hour kit with items to sustain you and your family during an emergency. Include water, non-perishable food items, batteries, flashlights, blankets, battery-powered or hand-cranked radio, first aid kit, whistle and cell phone chargers. · Sign up for local alerts and warnings and monitor weather reports. Learn the difference between watches and warnings and know what it means to shelter-in-place or evacuate. · Look over your insurance policies and see what coverage you have. If you don’t have flood insurance, consider adding it now. · If you have pets, make sure to include them in your plan. Prepare a 72-kit for them as well with food, water, portable dishes, a leash and toys. Check into shelters or other locations that would accept your pet should you have to evacuate. · With nearly every disaster comes power outages. · But you can prepare for outages, particularly extended outages, today. · Take an inventory of all items that you would need to rely on electricity, particularly medical devices as well as any medication that may need to be refrigerated. · Fire-proof your home. Install smoke and carbon monoxide detectors in your home. · Create a fire-resistant zone around your home free of leaves, debris and flammable materials. · Keep important documents in a fireproof, waterproof place. Prepare now and plan for disasters. For more information on preparing for disasters go to www.ready.gov. Being prepared for a disaster or an emergency is something we plan for and act on throughout the year. But during the month of September, which is also National Preparedness Month, the focus on preparedness takes center stage. The theme for this year’s Preparedness Month is “Disasters Happen. 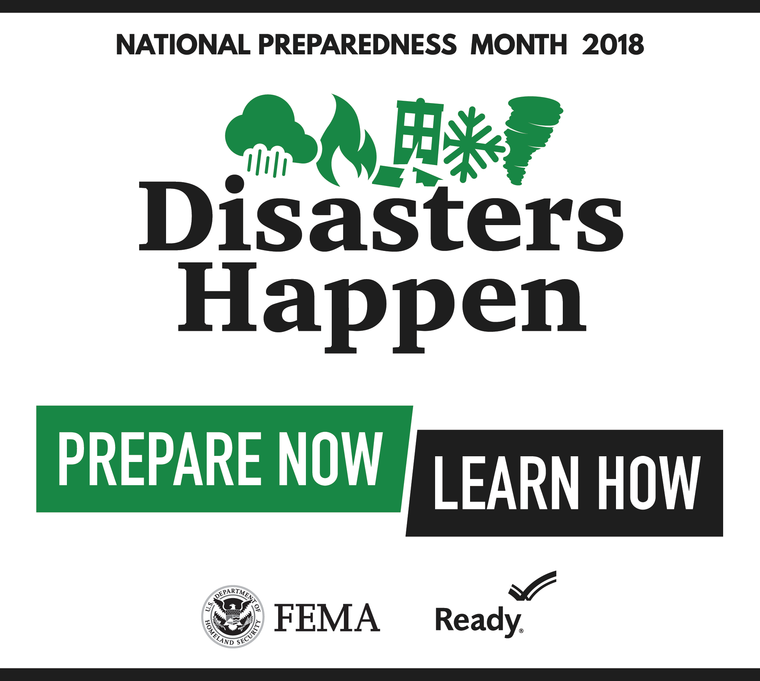 Prepare Now, Learn How.” Throughout the month, we will be providing facts, tips and instruction on how to ensure you and your family are prepared for any type of emergency or disaster. This week, the focus is on making an emergency plan and practicing it. Disasters don’t always happen when we are at home. Do you or your family know how to contact one another during or after a disaster? Where will you reunite? Those are some of the items you should include in your emergency plan. Other suggestions for your plan: How will you receive emergency alerts or warnings? What is your shelter plan? What is your evacuation route? In preparing your emergency plan, don’t forget to take into consideration those family members with special needs: children, the elderly, non-English speaking, hearing or visually impaired, special medical needs. Do you have pets? Make sure to include them in your plan as well. Now Create an Emergency Plan, Communicate It and Practice It. Prepare Now, Learn How! Are you ready for winter? Prepare your family emergency plan today! Make a family emergency plan, communicate it and practice. Be Prepared! Winter can create all sorts of unexpected emergencies from power outages and blizzards, road closures and delays. Is your family prepared for these emergencies? Get prepared today! Start with making a family emergency communication plan that will outline what should happen should an emergency occur. For help in making a plan go to ready.gov/make-a-plan,. Contact numbers for all family members, to include work, school, daycare providers, doctors and other important emergency contact numbers. How to send and receive information to all family members, particularly if the power goes out and mobile phones and computers don't work. Emergency meeting places, which should include spots in your home, outside your home and outside your neighborhood. Once a plan has been made, communicate it to all members of the family. Make paper copies of the plan and keep it in a variety of locations to include the home, vehicle, purse, backpack, etc. Don't forget to practice the plan. Schedule regular meetings with all family members to review the plan and make changes if necessary. Practice texting and calling each other to make sure all numbers are correct. Designate a "lead" person to send out information to family members about where to meet and other emergency needs. Make sure everyone in the household, including children, know when and how to cal 911 for help. Only call 911 when there is a life-threatening emergency. Texting is the best way to communicate during a disaster, if you need to make a phone call, keep it brief and convey only vital information to emergency personnel or family members. Keeping calls to a minimum helps minimize network congestion. Conserve your cell phone battery by reducing the brightness on the screen,putting it in airplane mode and closing unnecessary apps. Keep charged batteries, a car phone charger and a solar charger available for backup power. If you charge your phone in your car, make sure your car is in a well-ventilated areas to avoid life-threatening carbon monoxide poisoning. If you evacuate and have a call-forwarding feature on your home phone, forward your home phone to your cell phone. Use the internet to communicate via email, Twitter, Facebook and other social media networks. These allow you to share information quickly or to find out if loved ones are OK. If you have a mobile phone, keep a prepaid phone card to use if needed during or after a disaster. Make a disaster plan to protect your property, your facilities and your animals. Create a list of emergency telephone numbers, including those of your employees, neighbors, veterinarian, state veterinarian, poison control, local animal shelter, animal care and control. County extension service, local ag schools; trailering resources and local volunteers. Include a contact person outside the disaster area. Make sure all the information is written down and that everyone has a copy. Ensure that poultry have access to high areas in which to perch, if they are in a flood prone area as well as to food and clean water. Reinforce your house, barn and outbuildings. Perform regular safety checks on all utilities, buildings and facilities on your farm. · Remove all barbed wire, and consider rerouting permanent fencing so that animals may move to high ground in a flood and to low-lying areas during high winds. · Install a hand pump and obtain enough large containers to water your animals for at least a week (municipal water supplies and wells are often contaminated during a disaster). · Identify alternate water and power sources. A generator with a safely stored supply of fuel may be essential, especially if you have electrical equipment necessary to the well being of your animals. · Secure or remove anything that could become blowing debris; make a habit of securing trailers, propane tanks, and other large objects. If you have boats, feed troughs, or other large containers, fill them with water before any high wind event. This prevents them from blowing around and also gives you an additional supply of water. · If you use heat lamps or other electrical machinery, make sure the wiring is safe and that any heat source is clear of flammable debris. · Label hazardous materials and place them all in the same safe area. Provide local fire and rescue and emergency management authorities with information about the location of any hazardous materials on your property. · Remove old buried trash—a potential source of hazardous materials during flooding that may leech into crops, feed supplies, water sources, and pasture. · Review and update your disaster plan, supplies, and information regularly. ARE YOU READY FOR OLD MAN WINTER? We encourage Pueblo to learn more about the best way to protect yourself this season! When it comes to threats associated with natural disaster, we are fortunate in Pueblo County to not have the coastal risks that effect many other US communities. Even the threats of earthquake or tornado are relatively low here in Pueblo. Some of our biggest threats are often forecast or come with some warning. Snow or thunder storms, and even wild land fires give residents time to leave or "hunker-down" as the threat approaches. You have opportunity to prepare your family for those risks and educate yourself on the steps to take before, during, and after the event. With winter upon us, the first message of the PreparePueblo team in 2015 is our reminder to you to be ready for OLD MAN WINTER! DO YOU KNOW YOUR ZONE?? The second push in the CSEPP Prepare Pueblo campaign is an important one for people living in and around the CSEPP Emergency Preparedness Zones. This quarter the message isKNOW. Do You Know Your Zone, it replaces the first message of the Prepare Pueblo, Talk. Emergencies can Happen Anytime. CSEPP decided to make the most of this campaign by not only reaching out to those citizens and letting them know, there is NO RISK to them but also to remind the citizens inside the zones to make sure they know which zone they in, and what the best actions are to take should they need to evacuate or shelter during an accident. CSEPP zones are based off of risk and "plume modeling". If you have questions about your zone or why your home is outside the zones, call us. The best part of emergency preparedness is, the risks may be different but the actions you take to protect yourself and your family are often the same. We'd love to share some emergency planning tips with you! 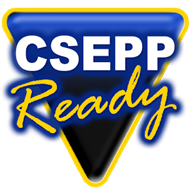 Do you know if you live in a CSEPP Emergency Zone? Knowing if you live in a response zone is key to knowing how to prepare and what to do if there is ever an emergency at the Pueblo Chemical Depot. Many of the zones don’t have people living in them (E1, W1, NW1, N2, and NW2). There are other zones that have fewer than 100 people (NE2, E2, W2, and N1). What’s most important is that people know if they live or work in an emergency zone, which zone and what precautions they may have to take if there is an emergency at the Pueblo Chemical Depot. It’s important to know where the emergency zones are and who is in the zones because if there is an emergency on the depot grounds, officials will instruct individuals what precautions to take based on the location of the emergency zones. For example: there may be an order put out that states “People living or working in Southeast 1 (SE1) should evacuate away from the U.S. Pueblo Chemical Depot now.” It would be important for those individuals living or working in that zone to know they are in the zone that is being asked to evacuate. Families are encouraged to discuss a plan and important details, such as where family members should meet, should they have to evacuate from their home during an emergency situation. Discussions surrounding emergency preparedness are not just for those individuals who live in a designated emergency planning zone, but should be everyone as emergencies can happen anytime and anywhere.Knowing if you live in a response zone is key to knowing how to prepare and what to do if there is ever an emergency at the Pueblo Chemical Depot. Many of the zones don’t have people living in them (E1, W1, NW1, N2, and NW2). There are other zones that have fewer than 100 people (NE2, E2, W2, and N1). What’s most important is that people know if they live or work in an emergency zone, which zone and what precautions they may have to take if there is an emergency at the Pueblo Chemical Depot. Discussions surrounding emergency preparedness are not just for those individuals who live in a designated emergency planning zone, but should be everyone as emergencies can happen anytime and anywhere. This quarter PreparePueblo reminds everyone that In a disaster Officials will often tell you to take a very specific action to protect yourself. Evacuation is designed to get you immediately away from a threat . Shelter in Place keeps you secure indoors until the threat passes. You can be ready for either one by packing an emergency kit. Water, Food, radio, flashlight, tools... Packing a kit means extra protection and peace of mind. A complete list of kit items is available by clicking HERE. Technology Works for YOU in an emergency! May is the third and final month for the most recent installment in the PreparePueblo Emergency Preparedness Campaign. We are encouraging people to use technology to make a difference in their readiness. Perhaps the most important step is the simplest. Register your cell phone for an emergency by visiting pueblocountyoptin.com! For this message, we took out billboards and radio spots encouraging Colorado Citizens to visit 911Colorado.org. Have YOU? If you click Pueblo from their homepage, you will be redirected to pueblocountyoptin.com and then you are only a couple of steps from getting emergency notifications from our 911 centers if there is a community or even just a neighborhood emergency near you. Other ways you can make technology work FOR you in a disaster? Social media is a big one. Local emergency agencies like the Pueblo County Emergency Services Bureau and the Pueblo Police Department have Facebook and Twitter accounts they will use during a disaster to share important information and updates. You can create a text group for you family too, technology can help reunite you if you are separated in a crisis. Even if there isn't a large scale emergency, a cell phone can be a lifeline in a personal emergency. If you are unconscious and alone, first responders often check your cell phone for an 'ICE" or In Case of Emergency Contact. That person can rely your hospital preference, your medical history, and help make critical decisions for you. Take advantage of technology today! 1. Create your ICE contacts. 3. Follow Pueblo County Sheriff's Office on Facebook and Twitter. 4. Create a family group text (be sure to include an out of town contact! ).